Welcome to Practical Toxicology, brought to you in partnership between Today’s Veterinary Practice and the ASPCA Animal Poison Control Center (APCC) (aspcapro.org/about-animal-poison-control-center). This column provides practical clinical information about diagnosing and treating pets that have been exposed to potentially harmful substances. Offers extensive veterinary toxicology consulting to organizations in industry, government, and agriculture. If treating a patient that requires emergency care for poisoning, call the APCC at 888-426-4435. It is Fourth of July weekend, and you are prepared for the many unscheduled appointments, from patients with gastroenteritis due to downing hot dogs to those suffering from noise phobia. However, the patients you end up seeing are neither fearful nor full of food. In the exam room, Mrs. Smith explains that her dog ate firecrackers. A technician takes a phone call and reports that Mr. Jones is coming in—his dog ingested sparklers. Then the whole Doe family arrives with their dog: while walking by the river this morning, Fido chewed on remains of the municipal fireworks. Should you worry about these patients? Hospitalize? Refer? How do you treat? Chemical reactions during the combustion process affect kinetics, bioavailability, and toxicity of various ingredients2-4; therefore, spent fireworks can have different compositions than unused fireworks. Charcoal (carbon) in black powder is composed of partially pyrolyzed (partially decomposed) cellulose from soft wood. Activated charcoal (activated carbon) is made specifically for medical use (ie, decontamination of the gastrointestinal [GI] system) by heating common charcoal in the presence of a gas—a process that creates many internal pores, which help trap chemicals within the activated charcoal. Most states and cities have stringent regulations regarding the purchase and use of fireworks, and differentiate between fireworks available for purchase by consumers versus licensed pyrotechnicians. The United States government uses the United Nations explosives shipping classification system to categorize fireworks: Class 1.3G includes most display fireworks, which require a Bureau of Alcohol, Tobacco, Firearms and Explosives (ATF) permit to purchase. Class 1.4G consists of consumer fireworks, which can contain a maximum of 50 mg of explosive material. Provision of instructions for proper use and list of cautions. In small animal practice, chlorate and barium result in the most problems associated with firework ingestion. As mentioned earlier, composition of spent versus unused fireworks can affect toxicity. Unused (unexploded) consumer fireworks can cause gastroenteritis in dogs. Unused display fireworks can cause methemoglobinemia, along with vomiting, diarrhea, lethargy, abdominal pain, and salivation. Chlorates are not only local irritants, causing GI effects, but potent oxidizing agents that can oxidize red blood cells, causing hemolysis and methemoglobin formation. Spent display fireworks from municipal displays cause more severe clinical signs. 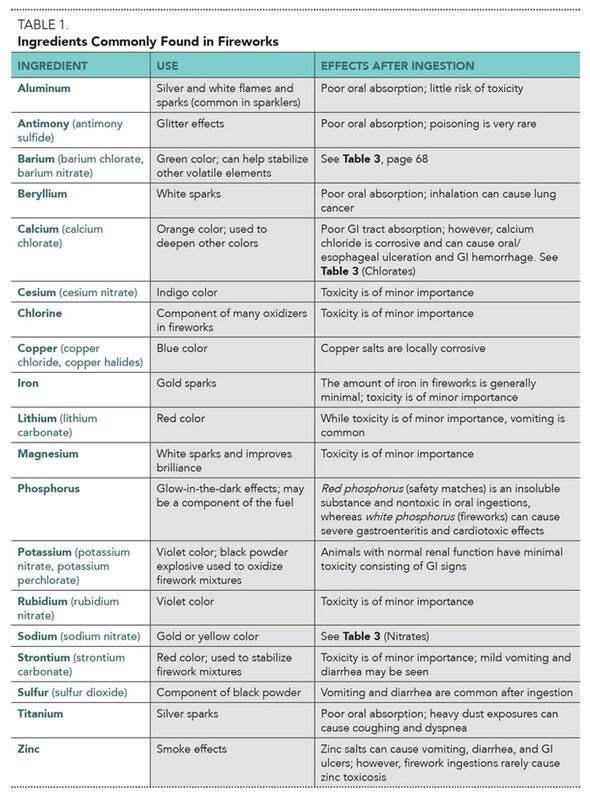 Often there is a significant amount of spent ash present, and the ash contains large amounts of more toxic firework components, such as barium (Table 3). 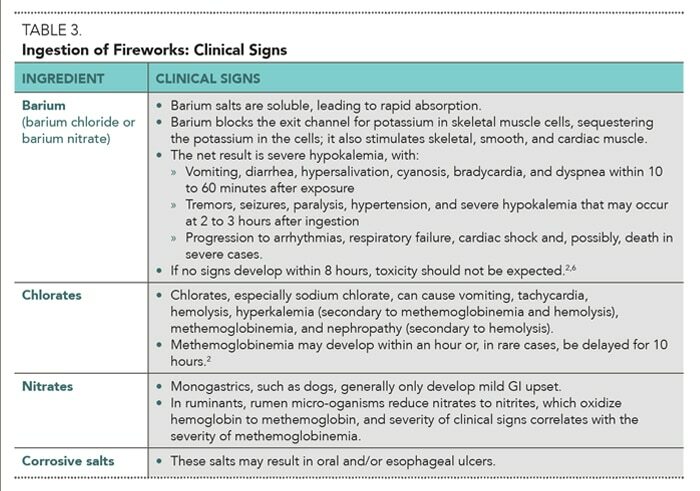 Illegal fireworks may be more likely to cause methemoglobinemia because they frequently contain high levels of chlorates (Table 3). In most patients, history provides enough information to diagnose firework ingestion. However, if a symptomatic dog is presented with an unknown history, the potential differential diagnosis for methemoglobinemia includes ingestion of acetaminophen, onions or garlic, aniline dyes, naphthalene, and phenazopyridine. Hemorrhagic gastroenteritis can be caused by parvoviral enteritis, arsenic, and dietary indiscretion. Where the firework was purchased: Illegal fireworks may be purchased from unauthorized firework stands, in other states or countries (ie, Mexico), from movie/TV production companies/suppliers, or through the Internet. Frequently, the answers to these questions are unknown and treatment is based on clinical signs. 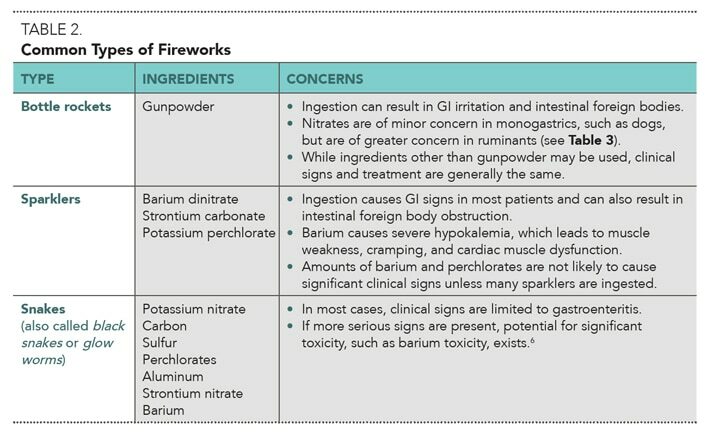 If the fireworks contain barium, magnesium sulfate precipitates barium in the GI tract and prevents further absorption. If the fireworks contain chlorates, administration of mineral oil may prevent absorption as well as speed transit time through the GI tract. However, administer mineral oil with caution; if the oil is aspirated, lipid pneumonitis may occur. However, if the ingredients are known to be corrosive, do not induce emesis. Note that activated charcoal does not bind to chlorates or heavy metals and, thus, is not recommended. IV fluids can be used to maintain normal blood pressure and urine production, and saline diuresis increases excretion of barium. If the animal is cyanotic, oxygen is recommended. Oxygen saturation and electrolytes, especially potassium, should be monitored. In addition, obtain a complete blood count, measure liver and renal function (baseline and at 24, 48, and 72 hours), and assess urine output. If chlorate toxicity is present, several options are available to assist in the conversion of methemoglobin to hemoglobin. Methylene blue (10 mg/kg IV as a 2%–4% solution); do not substitute new methylene blue for methylene blue. If methylene blue is unavailable, N-acetylcysteine (140 mg/kg IV or PO; then 70 mg/kg IV or PO Q 6 H for 5–7 treatments) can be tried. Ascorbic acid (vitamin C; 10–20 mg/kg IV, SC, or PO Q 4 H) aids in conversion of methemoglobin to hemoglobin and can be used as an adjunct treatment to methylene blue or N-acetylcysteine. However, if aluminum is an ingredient in the firework, do not use ascorbic acid because it enhances aluminum absorption. Adding sodium thiosulfate (2–5 g in 200 mL of 5% sodium bicarbonate PO or IV) to mineral oil to inactive chlorate ions. Administering sodium bicarbonate (1–2 mEq/kg IV; titrate up as needed) to shift potassium extracellularly; then monitor acid–base status carefully. Using blood transfusions to treat hemolytic anemia. The primary treatment for barium toxicity is to correct profound hypokalemia. Potassium chloride (not to exceed 0.5 mEq/kg/H IV) can be used to treat cardiac arrhythmias, hypokalemia, and diarrhea caused by barium. If the ingested fireworks contained corrosive salts, monitor for oral and/or esophageal ulcers, which may not be noted for 12 or more hours. However, oral and esophageal burns are rare in cases of firework ingestions. Sucralfate slurries (0.25–1 g PO Q 6–8 H) and famotidine (0.5–1 mg/kg PO, SC, IM, or IV) can be used to treat gastric irritation. Proton pump inhibitors, such as omeprazole (0.5–1 mg/kg PO Q 24 H), can also be used, especially for esophagitis. Opioids should be administered to address the pain of oral and esophageal ulcers, as needed. Soft or liquid diets should be fed. In patients with severe ulcers, an esophagostomy or gastrotomy tube may be required. A broad-spectrum antibiotic should be administered due to the risk for bacterial translocation. Most patients that have ingested fireworks respond well to symptomatic and supportive care. Recovery usually takes 24 to 72 hours (10–14 days for oral or esophageal burns). Ingestion of fireworks is just one more reason to leave dogs safely confined indoors during celebrations that end with a bang. Gondhia R. The chemistry of fireworks. Imperial College London; available at ch.ic.ac.uk/local/projects/gondhia/composition.html. Wismer TA. Matches and fireworks. In Osweiler GD, Hovda LR, Brutlad AG, et al (eds): Blackwell’s Five-Minute Veterinary Consult Clinical Companion Small Animal Toxicology. Ames, IA: Wiley Blackwell, 2001, pp 568-573. Martin-Alberca C, de la Ossa MA, Saiz J, et al. Anions in pre-and post-blast consumer fireworks by capillary electrophoresis. Electrophoresis 2014; 35(21-22):3272-3280. Gahagan P, Wismer T. Toxicology of explosives and fireworks in small animals. Vet Clin North Am Small Anim Pract 2012; 42(2):361-373. American Pyrotechnics Association; available at americanpyro.com. Rhyee SH, Heard K. Acute barium toxicity from ingestion of “snake” fireworks. J Med Toxicol 2009; 5(4):209-213. Charlotte Means, DVM, MLIS, Diplomate ABVT & ABT, is Director of Toxicology at the ASPCA Animal Poison Control Center (APCC). She received her DVM and undergraduate degree from Oklahoma State University and a master’s degree in library and information science from University of Oklahoma. Dr. Means worked in small animal practice and as a clinical medical librarian before joining the ASPCA APCC.